Stamped Sophisticates: Nature Sings Stamp set from Stampin' Up! I'm still distracted by our early peek at the full Stampin' Up! Holiday catalog which demonstrators have been able to preview on-line yesterday. This week, Stampin' Up! has been showing us sneak peeks and card samples from the new catalog. All I can say is, "Stampers, hold on to your pocketbooks! You are going to have a hard time resisting all of the wonderful Fall and Holiday products coming your way in the Holiday catalog." Over the next few weeks I'll be placing a demonstrator pre-order and getting my hands on some of these wonderful products. Then, in late August, if you're one of my customers, I'll see that a Holiday catalog arrives in your mail box so that on September 1, you'll know what products you'll want to add to your Wish List so you'll be able ready for Fall, Halloween, Thanksgiving, and Christmas projects. Meanwhile, I'm playing with Holiday stamps available right now from the Stampin' Up! Annual catalog. I've been working on swaps that had to go into the mail today, and I'll show you one of the cards I made. While I'm writing this post at dusk, I'm looking out my second story window and watching three deer frolic in the grassy knoll in the woods behind our home with their late June/ early July babies. In the past couple of weeks the babies have begun to venture out with their mamas. The mamas tend to keep them hidden for a few weeks after birth, and only bring them out when they are old enough to eat corn we put out for them, and after the mamas have taught them how to avoid some of the dangers they might run into in the woods. I use the Nature Sings stamp on this card. The elk in this stamp set reminds me so much of what I see from my window most mornings and evenings, I knew I had to own this set when I saw it in the catalog. After all of the Spring cards with bright yellow and berry colored daisies and soft pink roses, this card has such a warm, winter feel that you can almost smell the fire crackle in the background as you watch this scene from your lodge window. I created a fold over edge in Chocolate Chip to matt the Very Vanilla image layer. The Elk are stamped in Soft Suede and the trees are stamped in Old Olive. I use a sentiment from this stamp set, which is stamped in Soft Suede on the Crumb Cake portion of the background. I accented the line between the wood grain and the Crumbcake background with the new Gold Mini Sequin Trim. Its only 1/8" wide and it is so easy to work with. I find it much easier to work with than full-size sequin trim we've had in the past. I'm going to be ordering more of it with my next order. On the edge of the fold on the image block, I used two of the Gold Metallic Enamel Shapes. Once I finished these swap cards, I found it hard to put them in an envelop and send them away. I'm glad I made a couple extra for my display boards. I'm really in love with this stamp set. Click on an image below to see a larger images and to go directly to my Stampin' Up! store to find out more about each product. The July 30 card class has a couple seats remaining. Register by 10:30 am Saturday. We're making these 8 cards. Four general occasion cards, one Fall card, and 3 Christmas Cards. We'll use a large number of stamp sets, punches and die cuts. We'll do heat embossing, dry embossing and two step stamping techniques. Create our own Designer Series Paper using stamps to create textures and patterns. We'll use Silver Foil paper, Dazzling Diamond Glimmer paper and an assortment of cardstock, die cuts and ribbons to create our cards. Get a closer look at the individual cards we'll make by visiting the photo album for this class on my Meetup site. While there, register for the class, before all seats are filled. We would love to have you join us! Register for this class now. Sign-up details and what to bring are listed on my Meetup site. Reminder: Great Stampin' Up! Specials and Sign up offers going on right now. 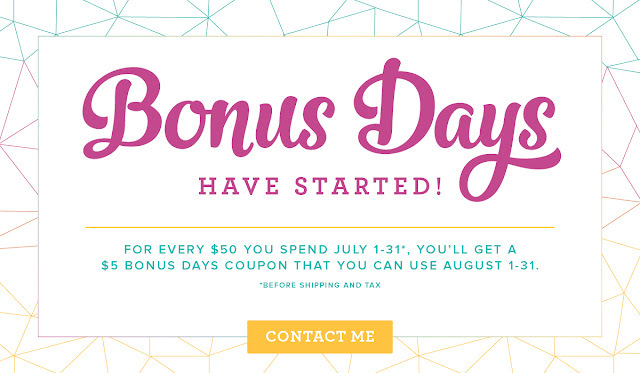 Earn a $5 coupons for each $50 purchase you make in July. Use your coupons on your August order. Download a free .pdf of the catalog, to see hundreds of new products. $150 plus orders (not including tax and shipping) qualify you for stampin' rewards -- free merchandise you select and add to your order totalling 10% of your order. And, once you've placed your July order, you'll receive an email with three $5 coupon numbers you can redeem for catalog merchandise during August. Wow! Spend $150 and get $180 worth of merchandise!--$15 in Stampin' Rewards with your July order and another $15 to spend in August. You pick what you want from the catalog for your free rewards. What a great deal! Want to see the Holiday catalog now? And place your Holiday catalog order August 1 instead of waiting until Sept 1? Demonstrators who sign up in July, get early access to the Holiday catalog on August 1, plus a gift of an essentials tools pack and a free Holiday stamp set. Its like Christmas in July! Read all the details in my previous post.